FAQ : What is the difference between a coil pair, a line pair and a se-tenant pair? There are many different types of stamp formats to collect—singles, coils, and blocks to name a few. Sometimes the differences can be confusing to the novice collector. This article will attempt to explain the difference between coil pairs, line pairs and se-tenant pairs. Coil stamps are stamps which are printed onto paper from a cylindrical press and then sold in long strips (strips that are in a one-stamp width) which are rolled into a coil. 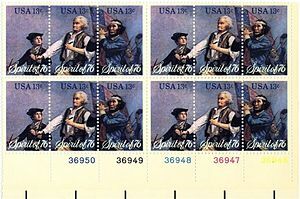 The individual stamps are separated from one another by perforations. Some coil stamps are separated by perforations running vertically, others are perforated horizontally. In both cases therefore, the individual coil stamps have two smooth sides and two perfed sides. What is a coil pair? A coil pair is two coil stamps still joined together at their shared perforated edge. Generally, collectors like to collect coil stamps in pairs because a pair better accentuates the differences between the perforated edge and smooth edge. Technical note: When the perforations run vertically (such as the one shown left), the stamps are called a horizontal coil pair. When the perforations run horizontally, the stamps are called a vertical coil pair. What is a line pair? A line pair is a pair of coil stamps which has an inked line between the two stamps at their perforated edge. This line only occurs every so often on a roll of coil stamps. There are technically two different kinds of line pairs—joint line pairs and guide line pairs. Joint line pair : The inked line occurs in older coil stamps because they were printed from a cylindrical plate. A flat printing plate was wrapped around a roll to form a cylinder. Where the two edges of the cylinder meet, or join, there is therefore a seam. Ink would occasionally accumulate in this seam and be transferred to the paper, leaving a smudgy line. Guide line pair : Sometimes, to help in counting the stamps being printed, a guide line was actually engraved onto the printing plate. This printed line is usually more defined and crisper than a joint line. In both cases, the line pair is made up of two unseparated coil stamps on either side of the inked line. Since line pairs tend to be more rare, many collectors are willing to pay more for them. What is a se-tenant pair? A se-tenant pair (from the French meaning ‘joined together’) are two stamps still attached at their shared perforations but which feature a different design or denomination (the most common being a pair with different designs on each stamp). Se-tenant stamps can also come in strip or block form. Sometimes the two or more stamps have designs on them which, together, make for one complete image. If a strip of three se-tenant stamps form a complete design, this is referred to in philately as a ‘triptych’. If a block of four se-tenant stamps form a complete design, this is called a ‘quadripartition’. Tête-bêche pair : From the French meaning ‘head-to-tail’, a tête-bêche pair is two stamps that are printed upside down in relation to one another. Sometimes this is intentional, but in some instances it is due to a printing error—such tête-bêche pairs are obviously prized by collectors. Gutter pair : A ‘gutter’ is the space, or selvage, between stamps on a sheet. These spaces can be blank, inscribed, or have a design on them. A gutter pair is made up of two stamps with the gutter still attached and in between them. In other words : stamp—gutter—stamp (the gutter has no postal value). It really is fascinating to dig deeper into the various collectible stamp formats. These original ways of collecting stamps can add esthetic, as well as monetary value to your collection. I have some Yugoslavia unused stamps 1973-1987 in pairs or multiples(two or four stamps not separated). Is there any difference in value compared to separated stamps? Well, it depends if your multiples are from coils or not or if they are a corner plate block. If they are only regular stamps, there is no difference in value.